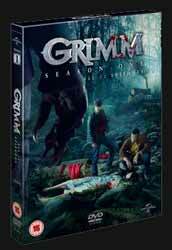 Grimm is an interesting idea for a TV series. It takes the usual cop show and mixes in a little of Supernatural and The X-Files. The basic premise is that the famous brothers Grimm were not just collectors of myths, local folklore and fairytales, they were part of a group of hunters who were collecting data on all of the beasts that hide in plain sight. When Nick's aunt is killed he discovers that her caravan is actually filled with reference books and material as well as weapons and inventions designed to dispatch the monsters that walk among us. The creatures look human to everyone else, but they have powers that can pose a threat to the innocent. There are various levels of threat amongst the creatures, which range from the harmless, the ruthless and the reformed. One such reformed creature is Monroe, a Wider Blutbad, or Big Bad Wolf. Nick first meets him in the pilot episode when he's looking for a missing little girl, and over the course of the show Monroe comes to be Nick's helping hand when it comes to all things relating to the world of the creatures. The majority of creatures that come into contact with Nick instantly recognise that he's a Grimm and are terrified, or at the very least weary of him. For generations the creatures have been told bedtime stories about the horrible acts that Grimms undertake to their kind. Nick has to balance his detective work with some unorthodox practices - as it soon becomes obvious that only creatures commit crime in his jurisdiction. Monroe (Silas Weir Mitchell) is by far the most interesting character. I have to be honest and admit that I wasn't overly keen on Nick (David Giuntoli). I think it's because he's very two dimensional. This also goes for Hank Griffin (Russell Hornsby) Nick's cop partner. Comedy relief comes in the form of Sergeant Wu (Reggie Lee) who should have been in way more scenes than he is. Beeware, in which a bee-like creature uses flash mobs to kill their intended victims. This episode stars Star Trek: Deep Space Nine's Kira Nerys (Nana Visitor). Tarantella, sees Nick trying to track down a killer who poisons their victims. It soon transpires that the killer is a spider-like Spinnetod who must kill three young men every five years to avoid ageing. This episode sees Amy Acker guest star (best known for playing Winifred "Fred" Burkle in Joss Whedon's Angel). The Thing with Feathers, in which Nick and Juliette take a short break, but they soon notice that the couple in the house nearby seem to be having difficulties. The woman his being held captive in the house against her will, and as Nick investigates he puts his and Juliette's lives in danger. Leave it to Beavers, sees a member of a construction company being killed off. It soon transpires that this bridge construction firm is run by beaver creatures who have not paid the proper respect to the trolls living in the city. This episode stars Dexter's Angel Batista (David Zayas). Big Feet, in which Nick and Monroe have to hide a creature that is a reformed monster after it appears he went on the rampage and killed some Yeti hunters. Extras include deleted scenes on various episodes; Making Monsters (6 min, 42 sec); Highlight Reel (5 min, 40 sec look at creature transformations, scares, fights and language); Cast Auditions (11 min, 36 sec feature which is interesting as it shows that Reggie Lee originally auditioned for the role of Hank); Gag Reel (3 min, 02 sec); VFX Progressions (2 min, 07 sec very shallow look at the morphing effect); The World of Grimm (10 min, 49 sec behind the scenes introduction to the show); and Grimm Guide (16 min, 09 sec a guide to some of the creatures in the show. Displayed as a book with textual info and clips of each creature). There are a number of story arcs that are woven throughout this season. These include Nick not knowing whether he should tell Juliette what is really going on; Hank falling in love with a witch who she has drugged to do her bidding; and the head of Nick's precinct being involved with the creatures in some way. While on balance I did enjoy this show, it's not one I'd be rushing to add to my DVD collection - it's more that I'd watch it if it were on TV and I was at a loose end.